FAQ: Why aren't Transaction (invoice) numbers showing up on my QuickBooks Online invoices? Are you invoices being created in Quickbooks online without a transaction/invoice number? Here's what to look for in your QBO account. 1. Custom Transaction Numbers for your QuickBooks Online (QBO) invoices are not supported through QBO's API. 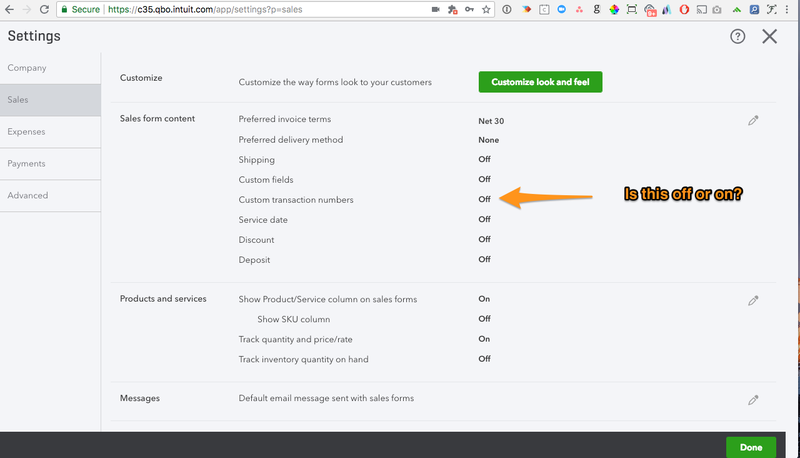 When this setting is enabled in your QBO account, invoices will still be generated but you will not see an invoice number either in your sales>invoice grid view, or on the invoice itself. You will need to rely on QBO's system generated invoice numbers when using Practice Ignition and QBO together. The system generated invoice number is simply a sequential numbering system.